October 9th in Gennett History, 1924: The Sioux City Six recorded “Flock O’ Blues” and “I’m Glad” in NYC. It appeared on Gennett 5569, Brunswick 02207, and Session 7. The recording featured Bix Beiderbecke (c), Miff Mole (tb), Rube Bloom (p), Min Leibrook (bs), and Vic Moore (d). 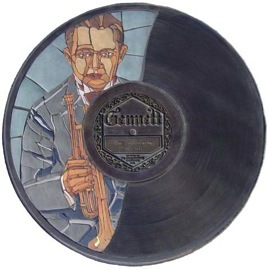 Video | This entry was posted in Gennett, Video and tagged Bix Beiderbecke, Brunswick 02207, Gennett, Gennett 5569, Gennett Discography, Gennett Records, Gennett Walk of Fame, Miff Mole, Min Leibrook, October, Rube Bloom, Session 7, Sioux City Six, Vic Moore. Bookmark the permalink.